Volkswagen Tayron. 2018 to date (prod. n/a). 5-door SUV. F/F, F/A, 1984 cm³ (I4 DOHC). 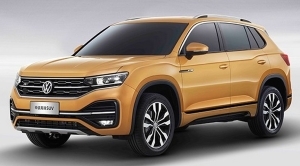 FAW–VW’s attempt to shift into a more upmarket SUV niche, namely the mid-size. Two turbocharged 2·0-litre units at launch, with 1·4 following. Head-up display available; large 10·3-inch touchscreen at the centre of the dashboard. Also featured adaptive cruise control and lane-keep assist.